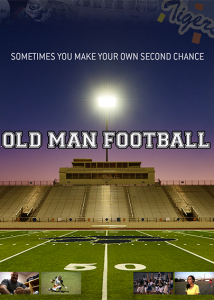 Old Man Football is a feature documentary presenting multiple stories of personal redemption for a group of grown men and women who return to Corpus Christi (Texas) Carroll High School. These ethnically diverse alumni play, cheer, and dance at a football game pitting players in their 30s and 40s against teenage, recent graduates and other younger alumni. The players honor the memory of a fallen teammate who was murdered at a young age. Relying on their wisdom, work ethic, and 'man strength,' the old guys try to reclaim past glory and to erase various regrets by strapping on helmets and pads in their attempt to relive their glory days on their South Texas high school football field.